BOP ON TREND: Navy at Brunch. Everyone was out and about this weekend in NYC and it would have almost been a sin not to with the gorgeous weather. 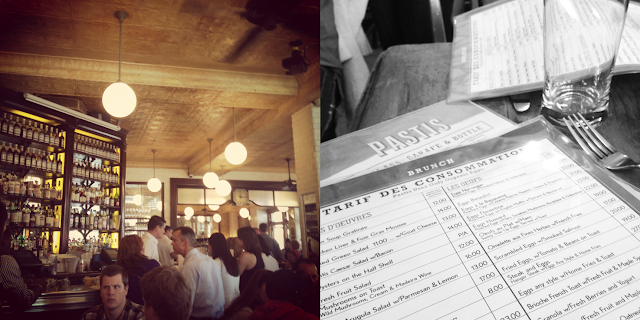 Although Standard might have had a 150 person line and getting in line at the Frying Pan was a mere three blocks away from the boat's entry, we were able to sit right down at Pastis for brunch in Meatpacking this weekend without the wait. We then parked ourselves at West Village's Whitehorse Tavern to enjoy the rest of the afternoon. Comfortable heels were key for walking and a blazer made of a casual light weight knit dresses up any look but keeps it daytime and weekend appropriate. Great look dear!Love the navy blue light brown combo! You look super chic!Love your gorgeous shoes!